'Tis the season . . . to be married. My refrigerator is covered in wedding invitations, save-the-dates, shower invites, and a general smattering of happy couples about to enter marital bliss. (I keep wondering if I can throw myself a "Yea! I'm single!" shower, and get lots of fabulous kitchen ware.) 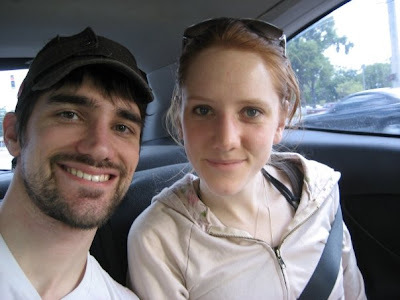 I do have one favorite couple, Kristin and Brian. They are getting married this month, and they are my lifelong friends. We've got two artists on our hands: Brian a painter/printmaker and Kristin a writer/poet/publisher extraordinaire. (Check out one of Brian's recent prints below. It shows one of our beloved Brooklyn views.) I love them, and I loved their recent wedding shower they just had in their new Brooklyn apartment. The food was delicious, and this Prosciutto Wrapped Asparagus flew off the trays in about 5 seconds. It was easy, classy and delicious. 1 bunch Large asparagus 1/2 lb. thinly sliced prosciutto Extra Virgin Olive Oil Kosher Slat 1. Snap off tough ends of asparagus spears. 2. 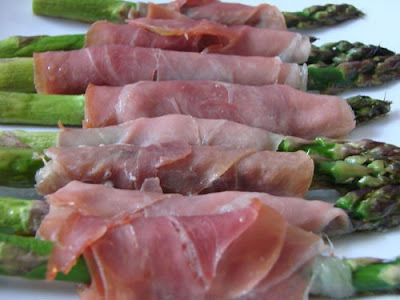 Wrap a slice of prosciutto around each asparagus spear. (No need to overlap the prosciutto too much. You can trim the prosciutto slice to just use half a slice for each aspragus slice.) 3. 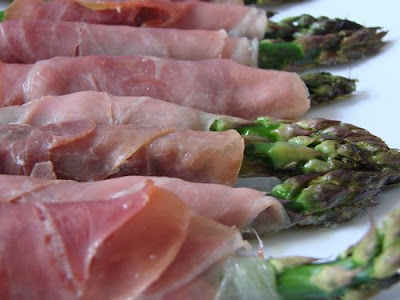 Lay the prosciutto-wrapped asparagus spears side by side on a cookie sheet. 4. Drizzle with a little Extra Virgin Olive Oil. 5. Place on top shelf of oven, and broil for 10 minutes (or until proscuitto starts to slightly crisp. These can be served at room temperature, so they're perfect for a party where people stop by all evening.